Thermochromic ink changes state in the presence of heat. When any heat source is applied (e.g. body heat, hair dryer, or electrical current), the pigment turns colorless. Here we will assume you want to use current to control the pigment color change. To see some examples in action, check out this post. 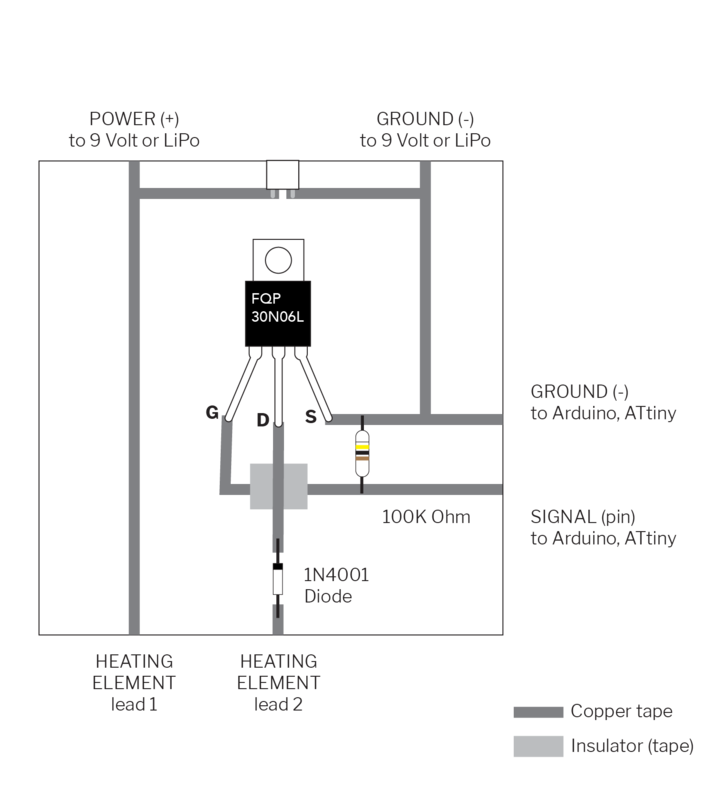 Usually if we feel heat coming off of a circuit or component, it means something is wrong. For example, perhaps you have a short circuit. In this case, we actually want to generate enough heat to change the pigment. We can do that using conductive thread, nichrome wire, or flexinol. 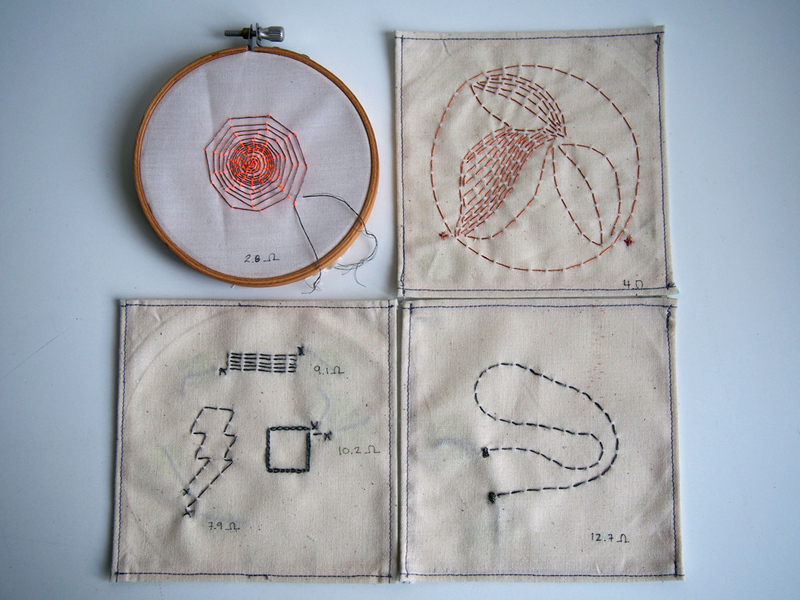 You can also use conductive fabric, but be sure to test that it actually has some resistance. Use your multimeter to check. Karl Grimm silver or copper thread. This thread is very conductive, so you have to use enough to create at least 2.5 ohms of resistance. Stainless steel conductive thread: This thread tends to have a lot of resistance, so you don’t need to use too much of it. 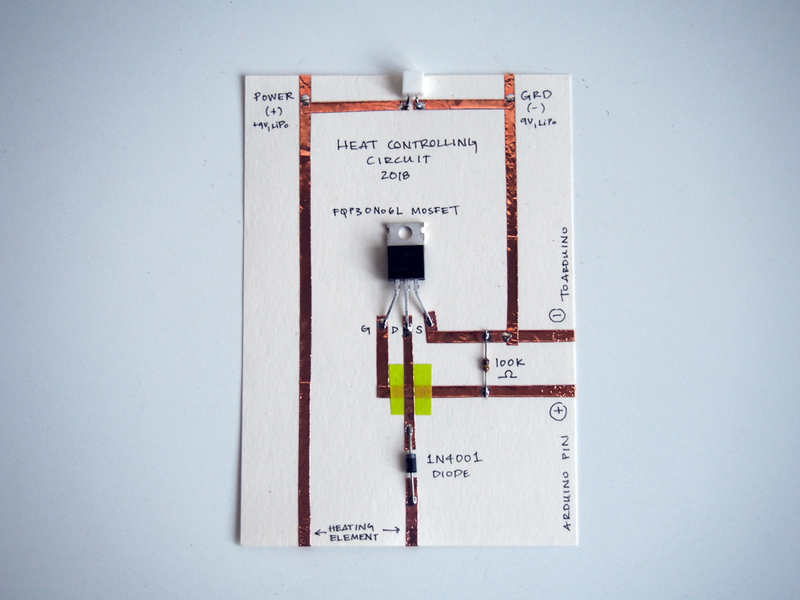 You should create multiple swatches of heating elements to test your design. You can find a YouTube playlists of tests I’ve made here. Ok. So you have your heating element. Great! 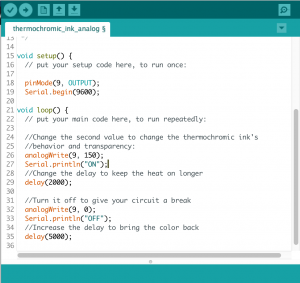 Now how do you control it with Arduino? 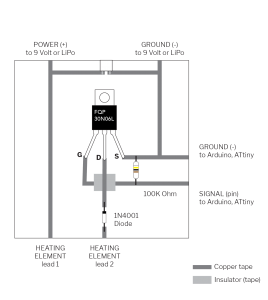 Heating takes a LOT of power – current to be specific. 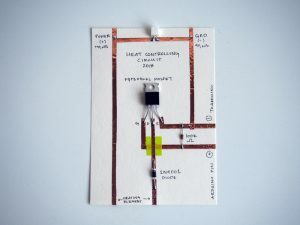 We want about 800mA to 1.3 Amps for this circuit. Arduino pins cannot provide the power we need to warm a heating element. Remember: you can’t draw more than 40mA from a pin. This means we need a separate power source for the heating element using a high load circuit. 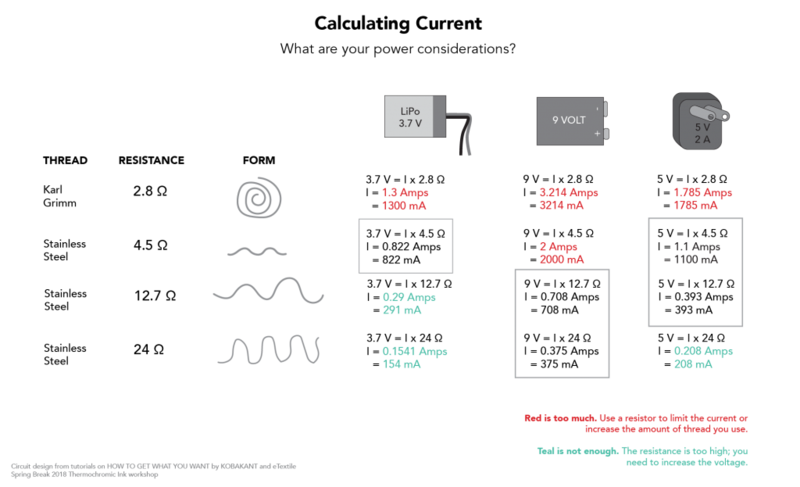 We can do this using the fantastic, amazing, phenomenal transistor – a MOSFET to be specific. Let’s take a look at how this works. 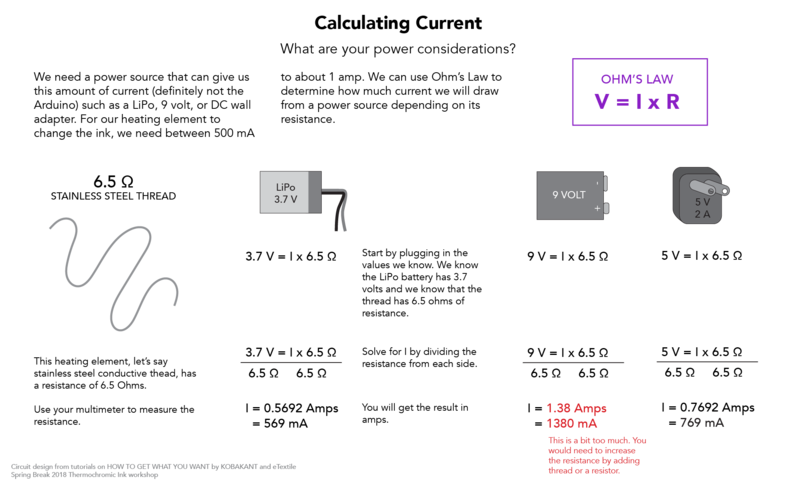 Basically, we are using this transistor as an electrical switch. 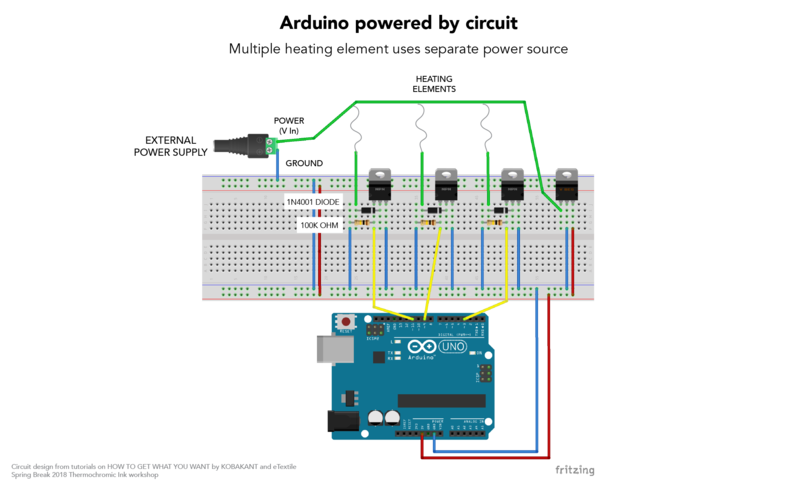 By applying a small amount of voltage to the gate using the Arduino, current can flow between the drain and the source. In other words, when we digitalWrite a pin HIGH or analogWrite a value to a pin, we turn on the secondary power source to heat up the thread. Now we know how to make the circuit, let’s talk about how to power your circuit. For wearable projects, you will probably want to use a battery. 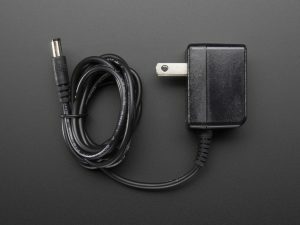 For stationary projects, you can use a wall power source. 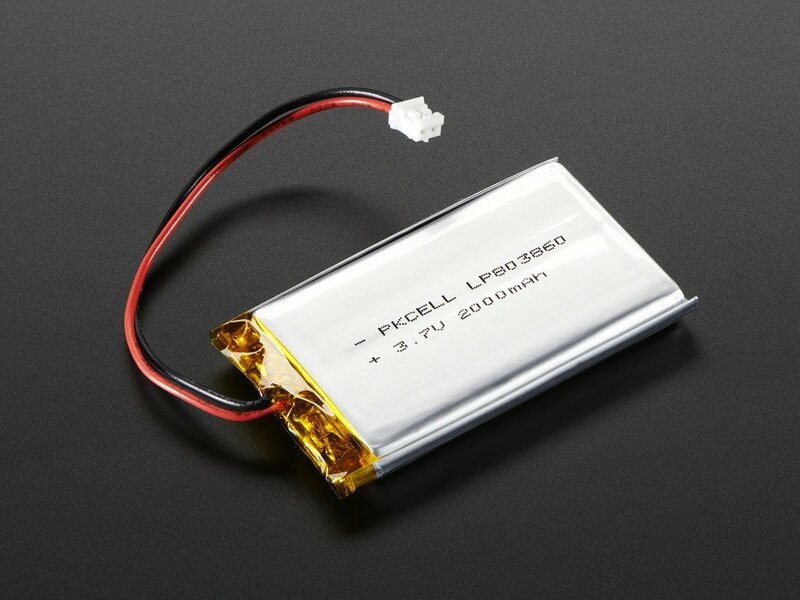 Lipo Batteries are 3.7 volts and come in different milliamps per hour sizes (higher will last longer). Here’s a good tutorial on them from Adafruit. 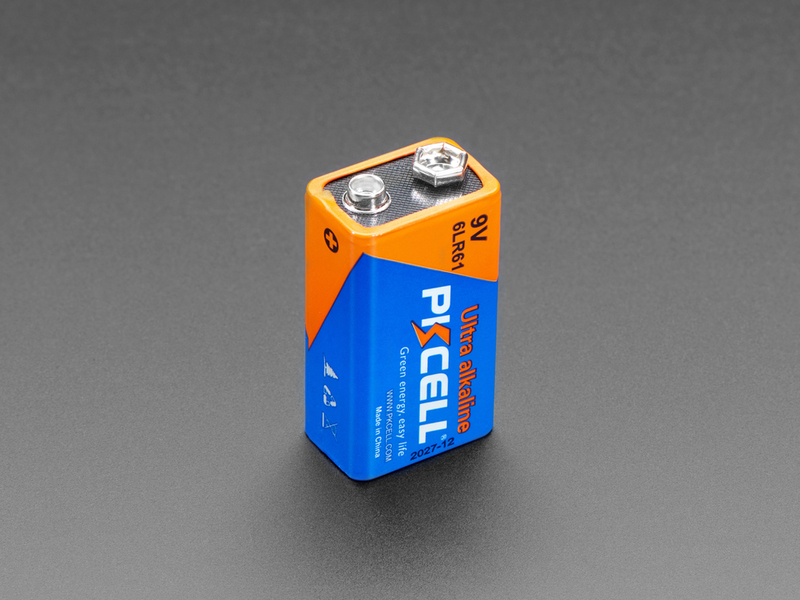 9 volt batteries give as much current as needed. 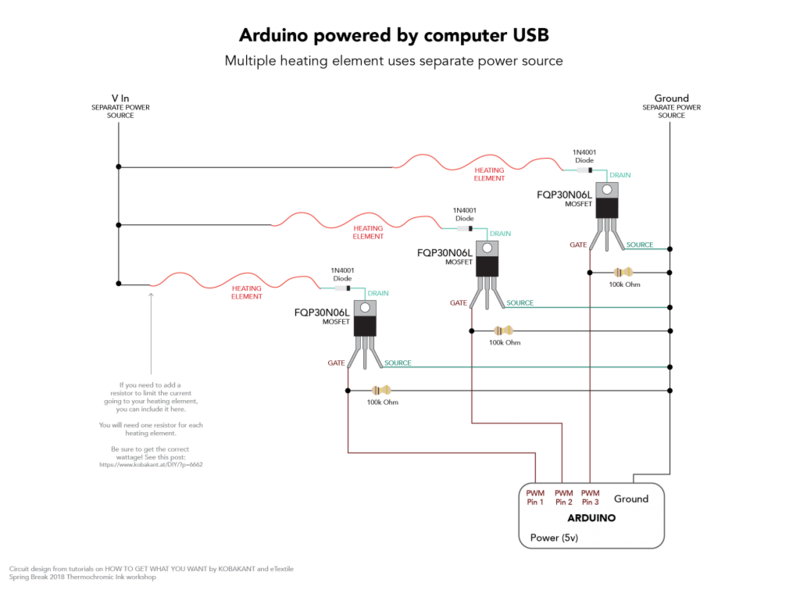 Wall power sources come in different voltages and amperages. 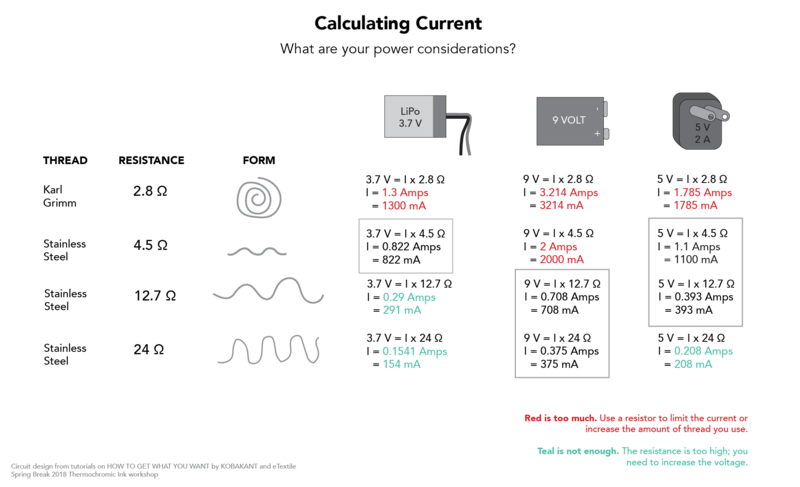 For example, Adafruit has a 5V DC 2A power adapter, 9V DC 1A power adapter, 12V DC 1A power adapter, etc. 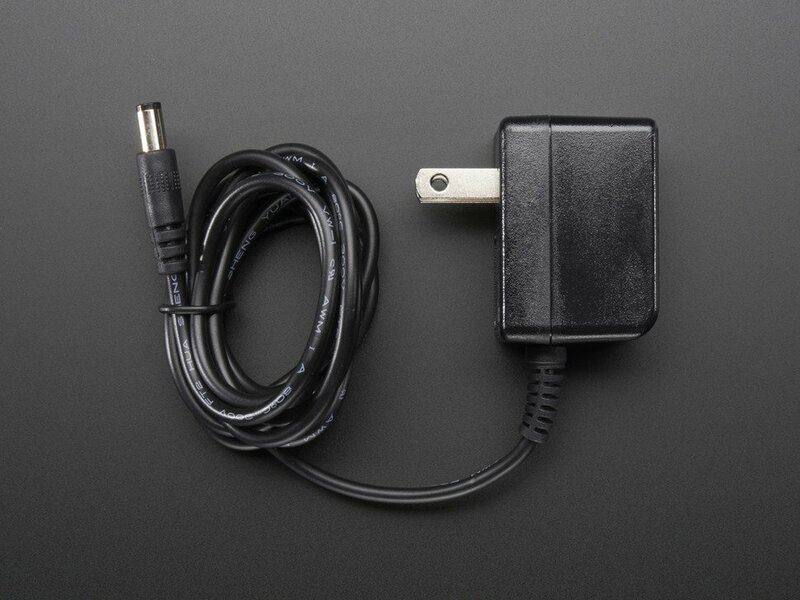 If you use this, be sure that the wall source is regulated – don’t just plug in any old one you have. 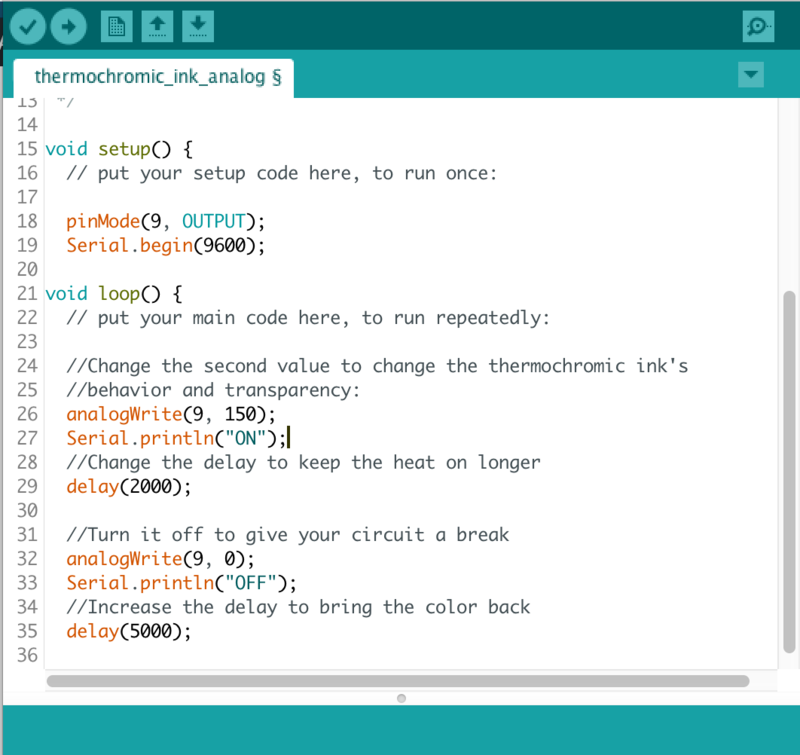 Here’s a good tutorial from Adafruit. 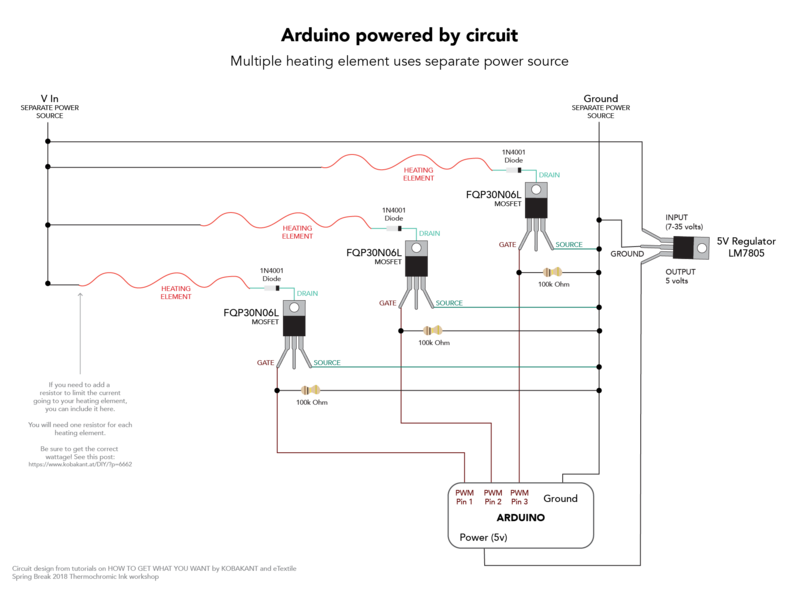 Here are some other options for power as well. But how do you know which one to choose? You can use Ohm’s Law to figure it out what voltage is appropriate: V = I x R. We can determine the resistance of our heating element using a multimeter and we know we want to have anywhere between 800 milliamps and 1.3 amps. So now we just need to solve for the voltage. Check out the worksheets below for a few examples. I prefer to use analogWrite because I can have more control over how much current I am letting through. If I am not letting as much through, I am comfortable keeping it on for longer with a shorter delay. Depending on what you are trying to accomplish, try changing the delay() values to change the behavior. Here is a link to the code. 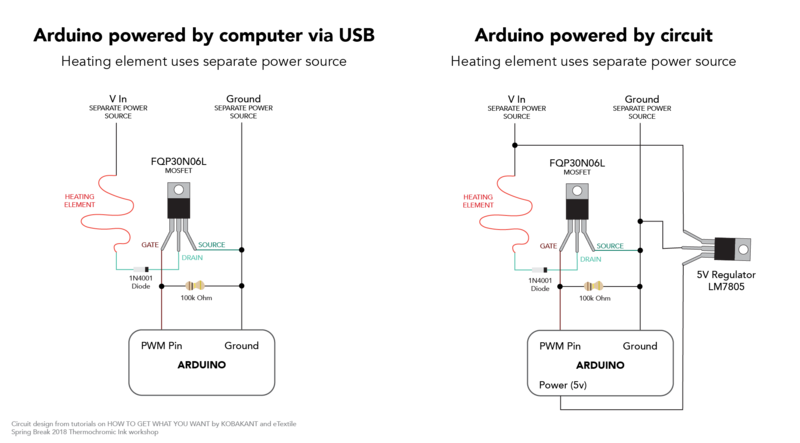 TIP vs Mosfet– overview of specific differences from Arduino forums.